That’s what some real estate agents and mortgage loan officers tell their clients but is it true? It’s true when you buy a home your lender will hire an appraiser to estimate the value of the house. It’s also true these appraisals help protect home buyers from paying WAY too much for houses. It’s not true that these appraisals protect buyers from overpaying at all. These lenders’ appraisals tend to run about 4% too high, according to one study, so they don’t protect home buyers from paying a few percentage points too much for their houses. Fair market value is a price range, not a single dollar price. That means before an appraisal will come in low, the contract price has to be unambiguously above the ambiguous fair market value range. Don’t expect the lender’s appraisal to protect you from overpaying for a house. It will probably protect you from overpaying WAY too much for a house but it probably won’t protect you from paying a few percentage points too much for a house. Do all your price research before negotiating price. If you’re getting an appraisal to try and remove the monthly Private Mortgage Insurance (PMI) fee from your monthly mortgage payment, be sure and let your appraiser know the value where your PMI would stop. Your appraiser may not want to know that, and it might not have any effect, but it might. Appraisers have a little flexibility because market value is a price range, not a single price. That appraisal of the value of the house you intend to buy will be ordered by your lender and is called… wait for it… a lender’s appraisal (or a bank appraisal). Now, that name may be a little confusing to home buyers because lenders make their clients – home buyers – pay for those lenders’ appraisals. Home buyers may think that since they paid for these appraisals that they belong to the buyers but they don’t. They belong to the lenders and are intended to protect the lenders. Does Knowing the Contract Price Change the Appraised Value? It’s long been known that lenders appraisals, that is, appraisals ordered by lenders to check on the value of homes, are usually at, or above, the price in the contract. Some people were suspicious that appraisers were just confirming the contract price to make their clients – the lenders – happy. In the olden days when Savings & Loans made most mortgage loans, S&Ls didn’t want to lend you more money for a home than the home was worth. Duh! But today is different and it has been for about 30 years. Back in the day, S&Ls used to keep on their books the mortgage loans they made. The homeowner sent their monthly mortgage payment to the S&L and that’s how S&Ls made money. S&Ls paid 4% interest to people who had passbook savings accounts with them and then they lent out the money to homeowners and charged 5% interest on their mortgages. In this example, the S&Ls made 1%. When S&Ls hang onto and own the mortgages they make, they lose money if they have to foreclose on homeowners so they really want to make sure they don’t lend a home buyer $200,000 to buy a home that’s only worth $180,000. Buyers are much more likely, of course, to stop making mortgage payments in that situation. The S&L can foreclose when buyers walk away but all they end up with is owning a $180,000 house that they essentially paid $200,000 for. And remember, S&Ls were operating on thin margins. Today is different. Today, S&Ls are pretty much dead and usually a mortgage broker or mortgage banker makes – or as they say, “originates” – your mortgage loan. You usually deal with a mortgage broker when doing all the paperwork for your mortgage but once the sale closes and you own the home, someone like Fannie Mae owns your mortgage, not your mortgage broker. Your mortgage broker gets paid immediately after the home sale and the mortgage loan documents are completed. That handoff of the mortgage to Fannie Mae, or whoever, means that if the homeowner later gets foreclosed on, the mortgage broker doesn’t care as much because the mortgage broker has already been paid. A foreclosure would mainly be the problem of whoever owns the mortgage at the time of the foreclosure. This separation of the “making of mortgage loans” from the “owning of mortgage loans,” makes it rational to do things that wouldn’t be rational in the old S&L system when S&Ls both originated and held the mortgages. A suspicion for decades has been that mortgage brokers and appraisers had an implicit or explicit understanding that appraisals should not come in lower than the contract price unless the contract price was way too high. Mortgage brokers don’t like low appraisals because they’re more work. Low appraisals will also end up killing some deals and when that happens all the work the mortgage broker put into making the loan is for nothing. Studies were done in the past to look at “appraisal bias” or “confirmation bias.” That is, whether appraisals were biased toward confirming the contract price so the mortgage loans can close and the mortgage brokers can get paid. But those past studies had to estimate the value of homes and compare their mathematical estimates of home values to the appraisers’ estimates of home values. This study we’re discussing here was a huge improvement because it didn’t have to estimate the value of homes using some math algorithm, they had 2 appraisals done within 6 months of each other on 8,533 houses. They were only comparing how the appraised values changed for the same homes. Fannie Mae took ownership of 8,533 homes from 2012 to 2015 after they foreclosed on them. After Fannie owned those homes, they had them all appraised before setting list prices and marketing the homes for sale. Later on, after they went under contract to buyers, all of these 8,533 homes got another appraisal, the lender’s appraisal, so this time the appraisers knew the contract prices. That is, this time the appraisers knew the price the buyers and sellers had already agreed to in their written contracts. The study found a surprisingly strong confirmation bias. The first graphic below shows the distribution of the appraised values compared to what the (future) contract prices (red line) would turn out to be. The second graphic shows the appraisals on the exact same 8,533 house but in these appraisals, the appraisers knew what price the buyer and seller had already agreed to in their contract. You can see a massive shift in the second appraisals – the lenders’ appraisals. Looking at the exact same 8,533 homes. 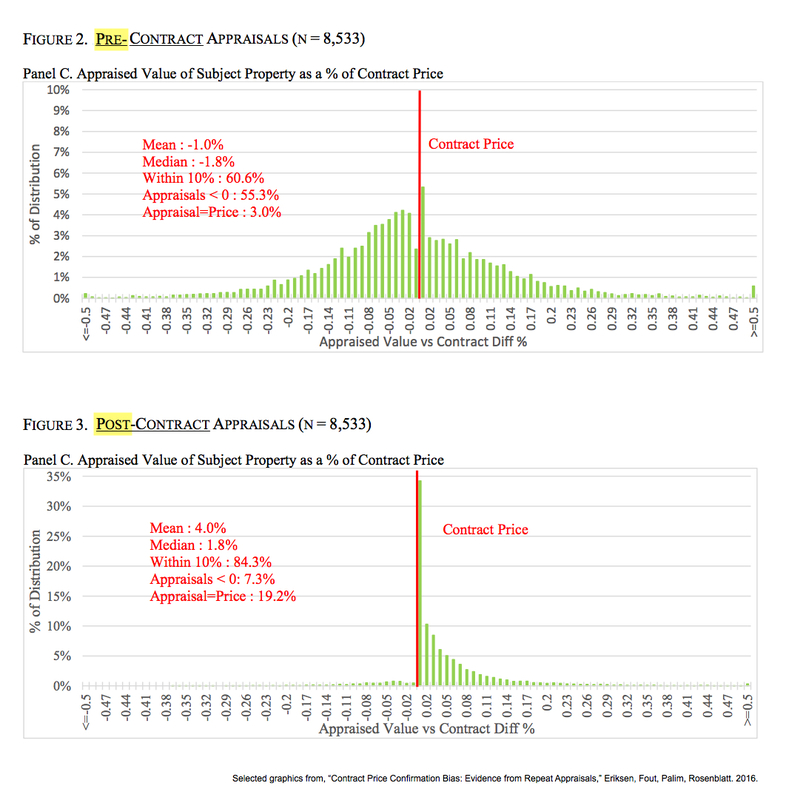 When the appraiser didn’t know the (future) contract price, only 45% of the appraisals came in at or above the (future) contract price. But when the appraiser knew the contract price, 93% of the appraisals came in at or above the contract price. After adjusting for the fact that home prices may have risen from the time of the first appraisal to the time of the second appraisal, the study concludes that the second appraisals (the lenders’ appraisals) were 4.2% higher on average than the first appraisals on the same homes. Here’s a quick and dirty explanation of how appraisals are done. Select Comps. To estimate the value of a house, an appraiser will look for similar homes that have sold recently. These homes are called comps, or comparables. Adjustments. The comps won’t be identical so the appraiser will have to make “adjustments” to the value of the comps to make them more comparable to the home under contract. If a comp is larger or is otherwise better than the home under contract, the appraiser will make a downward adjustment to the comp’s value to make it more comparable to the home under contract. “What would the value of the comp be if it had the same square footage as the home under contract?” Or, whatever. Appraisers apply adjustments to all the comps and get a good idea of what the home under contract is worth. Weighting (reconciliation). Some comps, however, may be a lot better than others. Let’s say one comp is in the same subdivision, built by the same builder, is the same model and floorplan and it sold only a month ago. That’s a great comp so the appraiser can give it more weight. 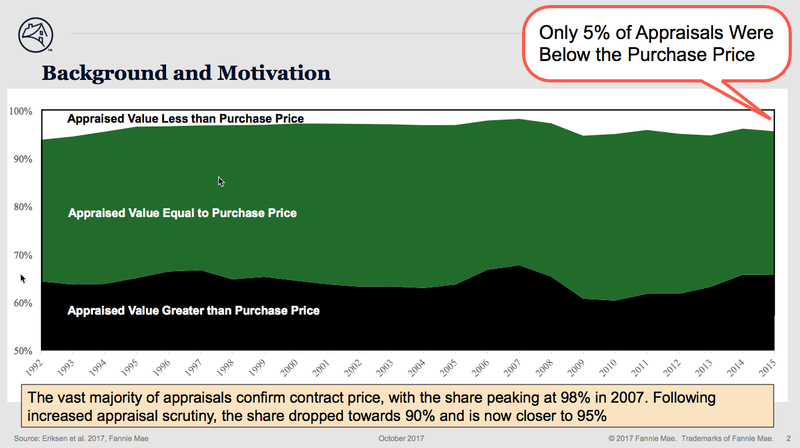 If there were 3 comps in the appraisal, instead of giving each one a weight of 33.33%, the appraiser could give that great comp a weight of, say, 50% and lower the weights on the other 2 comps. FYI, this weighting step is where appraisers tend to make their appraisals come in at, or higher than the contract price. They tend to give more weight to more expensive comps which raises the appraised value of the home being appraised. Hearing that helps his clients ratchet down their fear a bit so they feel more comfortable about making written offers to buy houses. Then after the buyer and a seller come to an agreement in writing on price and terms, the mortgage company will order an appraisal to make sure they aren’t lending the buyer more money than the house is worth. Like in the S&L days, your lender wants to make sure they aren’t lending you, for example, $200,000 to buy a $180,000 house. Mortgage Fraud. In fact, there was a type of fraud we saw during the real estate boom that centered around just that. The seller would set up a straw buyer who would pay the seller way too much for the seller’s house and the straw buyer would never make a mortgage payment after they owned it. It was a way to defraud mortgage companies. To make that style of fraud work, sellers had to have appraisers in on the deal. That fraud can’t work without dishonest appraisers so it’s extremely rare. Lender Guidelines. Appraisals are commonly used for something much more mundane than mortgage fraud, that is to verify that your loan qualifies for your interest rate. Interest rates are often tied to the size of the down payment, and the size of the down payment needed to get a lower interest rate is tied to the value of the house. your mortgage company probably won’t lend you any money at all if you have less than a 3.5% down payment. The appraised value is used by your lender, in this example, to calculate how much down payment you need to hit 20%, 10%, 5% or 3.5% or wherever the breakpoints are that trigger interest rate changes on your mortgage. If the contract price is lower than the appraised value, your lender will use the contract price to make those calculations. Whichever is lower, the appraised value or the contract price, your lender will use to calculate those percentages. About 92% of the time the appraisal has no impact on the mortgage loan because the appraised value is the same as, or higher than, the contract price. But about 8% of the time, the appraised value of the house is LESS than the price the buyer and seller agreed to in the written contract and that can increase the interest rate in the buyer’s loan. It could also make it so the buyer can’t qualify for a mortgage at all. First of all, if the appraisal comes in low that means you probably want to renegotiate the price down with the seller. And, in fact, that’s what happens about half the time when an appraisal comes in low, the price is negotiated down. Sometimes the buyer is able to negotiate the price all the way down to the appraised value and sometimes only part way. Either way, about half the time when an appraisal comes in lower than the price in the contract, the price is negotiated down with the seller and the sale closes at the lower renegotiated price. Also in this particular study, when an appraisal came in low the odds of the contract not closing (within 90 days) increased almost 10 percentage points. In those cases, most of the contracts were probably canceled by the buyers. Careful. This all depends on how the original contract was written. If the original contract had an appraisal or financing contingency clause written into it, the buyer will likely be able to cancel the contract if the appraisal comes in low. If the buyer has the option of canceling the contract when the appraisal comes in low, that gives the buyer leverage with the seller to renegotiate the price down. Let’s say the contract price is $200,000. The buyer has $40,000 for a 20% down payment and plans to borrow $160,000. If, however, the appraisal value of the house comes in at $180,000 instead of $200,000 that means unless they change loan programs, the lender will only lend the buyer $144,000 instead of $160,000, a $16,000 difference. The buyer could increase their down payment by $16,000 to make up the difference but more likely the buyer will renegotiate the price down to some degree with the seller. If the buyer can not get the seller to lower the price the buyer will have to come up with a larger down payment or cancel the contract (if the contract allows that). There’s a whole ‘nuther issue here that is rarely discussed and that’s how this “appraisal creep” tends to raise home prices all on its own. Those 4%-too-high appraisals let some homes sell for 4% too much and they, in turn, become comps for future appraisals that are an additional 4%-too-high and so on and home prices creep up. In addition, this could also have an impact on price indices like the Case-Shiller Home Price Index. But this post is already way too long so that topic will have to wait for another day. (1) Pre-appraisals are subject to the risk of ‘he who pays the piper’. In other words, because there is no bank or third party oversight with pre-appraisals, there is an inherent risk the appraiser is persuaded too much by whatever they are told by the person paying for the appraisal (usually the current homeowner who may be inclined to overestimate the value of their home). (2) The lender’s appraisal takes place AFTER a contract has been signed (and so the lender’s appraiser has been notified of that pending sales price). Thus, the lender’s appraiser receives the benefit of knowing what the actual market is bearing in real time; and this benefit is especially useful if the property was listed on the MLS and there were multiple offers (because competition is the best way to determine the actual market value). This article is practical and well cited. Thank you John! I really appreciate the way you focus on the numbers and provide these visual aids. I was surprised that so many appraisals come in above the purchase price. Its probably also worth mentioning that for FHA loans, if the appraisal comes in below the purchase price, then the seller/home is stuck with that appraisal for 120-days for any future/different FHA loan buyers. And VA appraisals have their own unique framework. Since I wrote that post I’ve decided the difference between pre-appraisals and lenders’ appraisals is this. – Pre-appraisals estimate the value of a house. – Lenders’ appraisals don’t estimate the value of the home so much as determine if the contract price is NOT within the fair market value price range. That’s very different than estimating the value. The fair market value is a price range so the lenders’ appraisal is trying to determine if the contract price is unambiguously NOT within the ambiguous fair market value price range.